What is Trisomy 18 (Edwards syndrome)? Is it better to carry to term or terminate? Where can I find help writing a birth plan? Where can I find stories and pictures of babies with trisomy 18? Where can I find support for pregnancy and infant loss, and for raising a child with Trisomy 18? How can God let this happen? Where is God in our suffering? How can I support my friends? We found out Abigail had Trisomy 18 before she was born, and we knew that she was meant to be a special blessing to us. We finally got to meet her in person on August 27, 2002. She gave us 5 days of cherished memories with her, then she went to be with Jesus on September 1, 2002. She was held in our loving arms virtually all of her earthly life; now she is being held in Jesus' loving arms for eternity. We have created this website to remember and honor Abigail Grace, who was and still is such a blessing to us. We also want to offer hope for anyone else who may have received a similar prenatal diagnosis, whether Trisomy 18 or another disorder that is "incompatible with life" - hope and strength for the path ahead. Do you have questions about a trisomy 18 diagnosis? Did your AFP test come back positive for trisomy 18? Did an ultrasound suspect it, or have you tested positive for trisomy 18 in an amnio? Which of these is a diagnosis of trisomy 18 and which of these is just a risk? For the answer, see Trisomy 18 Resources. Are you aware of the MYTHS about Trisomy 18? Did you know that even many doctors are unaware that these are myths? Read the truth about the Myths about Trisomy 18. Are you a friend or relative of someone whose child has trisomy 18? Are you looking for information about how to best support your friends? If so, look at the Trisomy 18 Resources to learn as much as you can about trisomy 18, and then read the section especially for friends called Helping a Grieving Friend. Are you questioning God? Or are you angry with Him for letting this happen to your baby? These feelings are normal, and God expects them. See how God is involved in you and your baby's life in Where is God in our suffering? Are you a professional; a doctor, nurse, or counselor who deals with families of children with trisomy 18? Please take a look at the Information and Suggestions For Professionals section just for you. Are you looking for ways to create memories of your child? Are you trying to plan a funeral that will honor and memorialize your child? 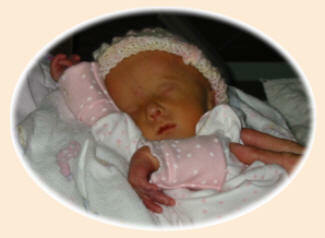 Take a look at Abigail's memorial service and find other ideas in the Memorials section. We recently added a new section as we celebrated Abigail's Second Birthday. I hope that this site can be helpful and encouraging and can help you grow toward God and toward healing. Thank you for visiting and honoring our daughter with us. Please let us know you've been here by contacting us or by signing the guestbook if you'd like others to read your message as well. ©2002-2006 Mindy Wilsford. All rights reserved. This site updated January 10, 2016.